Miami Trace senior Cassidy Lovett drives between two North Adams defenders, Karissa Buttleworth (11) and Delaney Harper (32) during the first-ever girls varsity basketball game at the new Miami Trace High School Wednesday, Feb. 6, 2019. 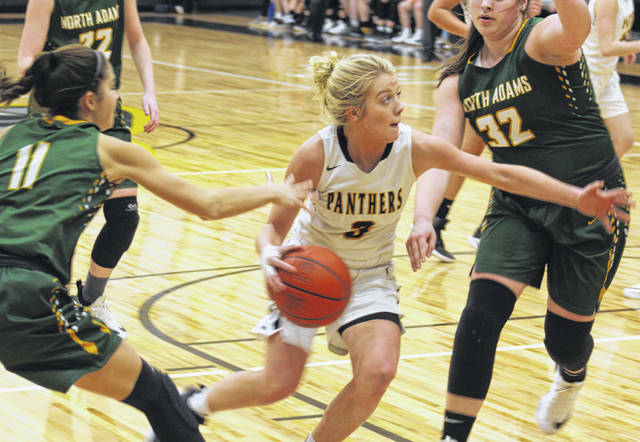 The Miami Trace Lady Panthers opened play in the new high school gym Wednesday evening with a non-conference game against North Adams. The Lady Panthers got off to a strong start and were able to hold on down the stretch for a 50-45 victory. Miami Trace (13-7) was led by senior Cassidy Lovett with 16 points. Lovett also had five rebounds, two assists and four steals. Junior Shay McDonald scored 14 and led the team with six rebounds and sophomore Gracee Stewart scored six points and had four steals. Becca Ratliff led with four assists and added three steals. It was senior night and all five seniors, Lovett, Olivia Wolffe, Ratliff, Tori Evans and Lena Steele, started. Steele scored the first basket in a women’s game in the new gym. Wolffe converted the first free throw in the new gym and McDonald hit Miami Trace’s first three-point field goal, that coming in the fourth quarter. Sophomore Delaney Harper was the game’s leading scorer for North Adams with 19 points. Sophomore Wiley Shipley scored 10 and senior Grace McDowell (also recognized before the game) added seven points. Miami Trace led 15-6 at the end of the first quarter and 26-13 at halftime. North Adams eclipsed their first half point total with 14 in the third quarter. Miami Trace scored 12 in the third and held a 38-27 lead with eight minutes to play. North Adams continued to battle and twice cut the deficit to five points late in the game. North Adams hit a three-point shot to make it 48-45 Miami Trace with 2.4 seconds remaining. The visitors fouled before Miami Trace could inbound the ball, sending Stewart to the line with 2.4 seconds remaining. She calmly sank both free throws to seal the 50-45 victory. “What a venue this is,” Miami Trace head coach Ben Ackley said. “For our kids and coaches and our community to have something as special as this, it’s kind of breath-taking. “All of our taxpayers, our administration, everyone that’s worked for this building and continues to work for it, I just hope they all know how grateful we are. “We’re very pleased to escape here with a win tonight,” Ackley said. “They shot the ball extremely well in the second half. I thought we got a little tired. This floor is 10 feet longer than the old floor and the kids are still getting adjusted to it. Miami Trace (6-2 in the Frontier Athletic Conference) has a make-up game at Jackson this evening and will then conclude regular season play with a home game against Washington Saturday at 7:30 p.m. The Lady Lions routed Waverly Wednesday, 72-36 to improve to 16-4. MIAMI TRACE — Olivia Wolffe 1-2-4; Cassidy Lovett 5-6-16; Becca Ratliff 0-0-0; Aubrey McCoy 2-0-4; Shay McDonald 4 (1)-3-14; Tori Evans 1-0-2; Magarah Bloom 1-0-2; Gracee Stewart 2-2-6; Lena Steele 1-0-2; Delaney Eakins 0-0-0. TOTALS — 17 (1)-13-50. Free throw shooting: 13 of 19 for 68 percent. Three-point field goal: McDonald. Field goal shooting: 18 of 53 for 34 percent. Three-point field goal shooting: 1 of 16 for 6 percent. Rebounds: 22 (7 offensive). Turnovers: 12. Assists: 9. Steals: 15. Personal fouls: 14. NORTH ADAMS — Mary Sonner 0-0-0; Wylie Shipley 3 (1)-1-10; Karissa Buttleworth 0 (1)-0-3; Carolyn Shupert 0-0-0; Braylie Jones 0 (2)-0-6; Marah Call 0-0-0; Grace McDowell 0 (2)-1-7; Delaney Harper 6-7-19; Faith Howell 0-0-0. TOTALS — 9 (6)-9-45. Free throw shooting: 9 of 13 for 69 percent. Three-point field goals: Jones, 2; McDowell, 2; Shipley, Buttleworth. Field goal shooting: 15 of 37 for 41 percent. Three-point field goal shooting: 6 of 13 for 46 percent. Turnovers: 28. Offensive rebounds: 6.